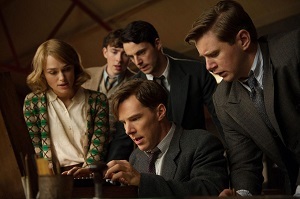 Righting one of the great wrongs of the 20th Century – not to mention U-571 – The Imitation Game is an excellent biopic that tells a tale of secrets and lies, and the poor sod who had to bear the brunt of them. As many may know, during World War II, the British were working hard to break the German Enigma code. An elite team of codebreakers worked in secrecy at Bletchley Park, and the story of their efforts was only revealed to the public 50 or so years after the end of the war. The father of computer science, Alan Turing, is played deftly by he of the oh-so-easily-made-fun-of-surname, Benedict Cumberbatch. Whilst it isn’t worlds apart from that of the other famous genius who lacks any kind of social skills, Cumberbatch’s finely tuned performance is distinct from his most famous role. He plays Turing as if he is constantly computing (heh) on a higher level. Even when he’s having an in-depth conversation, his mind is elsewhere, either because of his obsession with creating his machine, or because of the secrets he’s being asked to keep. He’s ably assisted by the likes of Matthew Goode (brilliant as ever), Allen Leech and Matthew Beard, whilst Charles Dance is almost as unlikeable as the TV role we all love to hate him in. Keira Knightley plays Joan Clarke, a gifted numismatologist who becomes closer to Alan than the rest of the codebreaking team. The screenplay is fantastic, and it only slips up once or twice, when it goes for the tried and true cliché of having a significant phrase repeated throughout the story, so as to give Alan’s life a neat narrative arc. For some reason this kind of thing always takes me out of a biopic; it may be no one else is in the least bit bothered. What’s most incredible, however, is the fact that the film isn’t horrendously depressing. Anyone who’s read about Turing knows that he was met with injustice despite his achievements, yet the film is at times humorous, tense and thoughtful, and it changes tone effortlessly. The film looks fantastic. The scenes of war, there to remind us what’s going on outside the confines of Bletchley Park, are a mixture of modern visual effects and stock footage. There’s nary a wasted moment either. I didn’t like the scenes from Turing’s childhood as much as the rest of the film, but it must be said that Alex Lawther’s performance as the young Turing perfectly complements Cumberbatch’s. An excellent period drama and enlightening biopic, The Imitation Game is the first great film of 2015. This entry was posted in Film Reviews and tagged Biopic, Drama, Period Drama, War by Stuart Wilson. Bookmark the permalink.